Born in 1974, Jonathan Pointer studied Natural History Illustration at Bournemouth and Poole College of Art and Design. His early interest in nature began as a child living in the Middle East. Creatures such as scorpions, lizards and bright birds fuelled his imagination, which was further nurtured on returning to live in Berkshire where woods, downs and water meadows replaced sand dunes and oases. 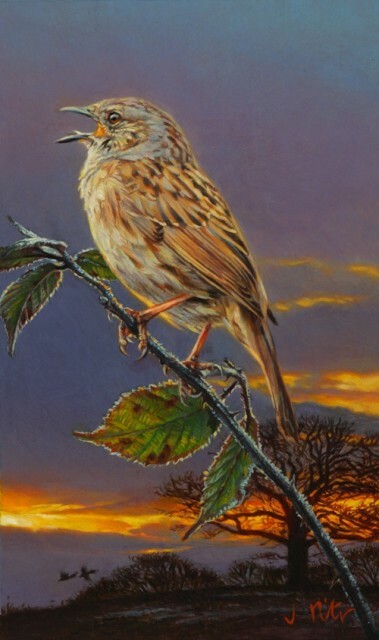 As a wildlife artist of great renown, Jonathan Pointer has travelled widely in search of his subjects, both exotic and familiar. His work portrays intricately painted vegetation, which, though convincing in itself, is always secondary to his portrait of an animal or bird. His detailed paintings are beautifully executed and full of life. His work has been exhibited widely, both nationally and internationally and has won several awards. He also works as a natural history illustrator and is a member of the Marwell International Wildlife Art Society. located midway between Winchester and Salisbury and Newbury and Romsey.